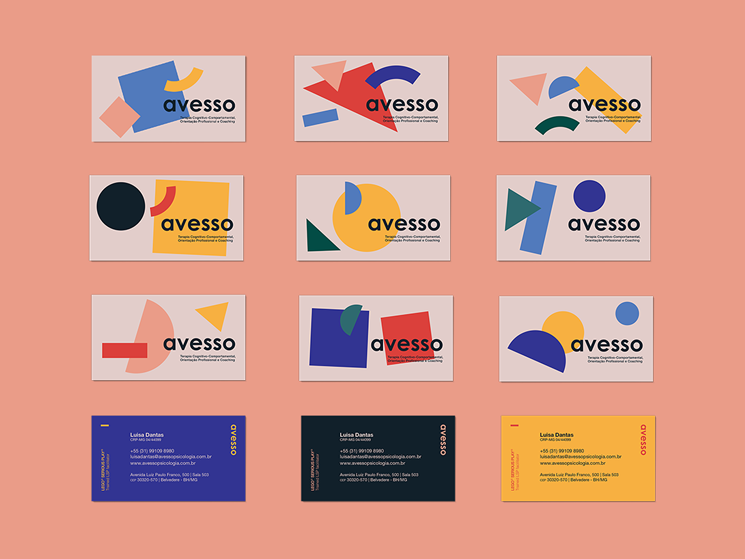 Estúdio Lampejo designed these business cards for Avesso, a modern and creative space that stimulates the practice of mental health through cognitive-behavioral therapy and professional guidance – approaches that are complemented and intensified by the use of the innovative Lego Serious Play® methodology. Estúdio Lampejo used a number of shapes, along with catchy colours on the visual identity. “In order to better express the proposal of the space, we opted for a visual identity that’s based on the balance of simple shapes and striking colors, at the same time thinking of dynamic, living and moving harmonies,” said Filipe Costa, one of the founders of Estúdio Lampejo. Avesso business cards came in a variety of back designs due to different shapes and arrangements, which is a great way to show uniqueness. Good use of color contrast improves readability while making the cards stand out. Aster Graf printed these business cards using silk-printing technique on Splendorgel EW 270 grs – a soft textured paper – to reach the exact colors of the project and to explore a tactile relation with the cards.